I havent deviated from my plan yet! I am still working systematically through the Love At First Stitch book from Tilly Walnes. The next project in the book is the Megan dress. This is a dress that had appeared on my Twitter and Instagram feed quite a lot recently so I was really looking forward to making one for myself. I didn’t have any medium weight cottons in so chose firm woven polyester knits for both makes! I love how this dress just came together. Nothing was a hassle and it just seemed to work. These are the projects that I LOVE! I cut all seam allowances down and overlocked. I’m using zips from my stash, so I chose to use quite a chunky zip rather than an invisible zip as recommended. Once I had inserted the zip, I tried it on and realised that I had made it far too short! I had held the pattern up to my body to determine the length and had decided to go for the shorter length…this probably wasn’t the best idea. I should have measured properly. Anyway, I wasn’t too disheartened as I knew it would make a nice long top. Here I am, wearing it with thick grey tights which I don’t think looks too bad but I think I would prefer to wear it with skinny jeans. Apologies for these photos. Adam is as about as good as a chocolate fire guard when it comes to taking photos… I thought he was improving until I looked at these! They will have to do though because I won’t get the chance to take any myself for a while as my tripod has a dodgy leg! I really liked making this first Megan, so I set off making a second with a tighter woven knit. I made this one a size smaller than the first and kept it the standard length. I think I may have traced the bodice slightly aft as my side seams didn’t match those of the skirt, so I ended up having a little tuck under each arm. As this was a very tightly woven fabric, the gathering stitches just wouldn’t pull together. These sleeves have 2 folds instead of gathers but I actually prefer them this way with this material. I’m still having some trouble inserting zips. I chose to have ‘normal’ zips on both rather than buy invisible zips. On the pink dress, I stitched the full back seam and then inserted the zip, which meant that the fabric around the base of the zip looked uneven and I had put the zip too low! On the blue dress, I inserted the zip and then did the rest of the seam. This time I ended up with a small pucker to the left of the zip. I’m not 100% happy with either really but I know that the faults are hardly noticeable when the dresses are on. Very cute, wearable dresses! The red one would be super cute with leggings. I might just have to make me a Megan after seeing these. 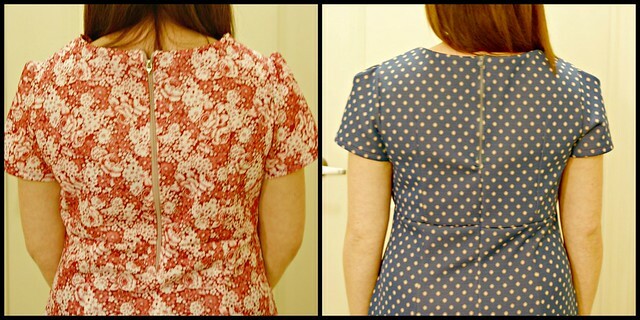 Adapting the dress pattern into a top was very clever!! And at least your have long hair to cover zips! Yes, you should! I’m tempted to make another one this week 😀 It seems like such a versatile pattern…my next one may be sleeveless! Yes long hair is good for any mishaps! Ooooh! What are you fancying first? I’m wondering whether I could squeeze a Megan out of 2 metres of 45inch fabric?! I’ve got some lovely fabrics in 2m only, including some Liberty which I would love to use for a Megan 🙂 was the make you saw using 2 fabrics a Megan too? Gosh that short option definitely is short, isn’t it?! Looks good as a top though. Thank you 🙂 These are both thrifted fabrics too so cost less than $1 for both! The floral is very short… I think I feel better when I’m wearing it with jeans. Those are both very pretty! Man, I have one way to put in zippers that I love and I don’t deviate from it-I’d rather change my pattern around a little to accommodate for my way of putting in a zipper than to use another way! Ha ha! “About as useful as a chocolate teapot” is another phrase we use! Great efforts on the dresses and you’re right, the bits you’re not happy with don’t show anyway. Wow you are crazy talented?